So, what does original Candyman actor Tony Todd think of the recently announced 'spiritual sequel'? 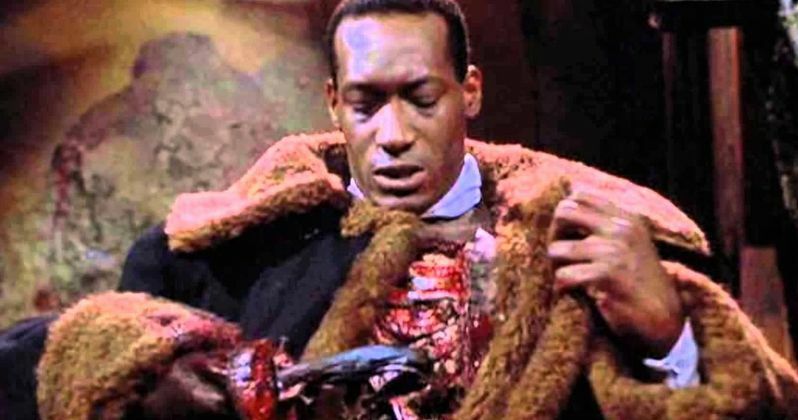 A few months back a killer rumor started circling these here internets claiming that Get Out writer-director Jordan Peele was producing a remake/reboot of Clive Barker's Candyman. And then a week or so ago, the rumor was confirmed and Peele let the world know that he was, in fact, not only producing the film, he was going to be penning the screenplay along with Win Rosenfeld. Not only that, but Jordan Peele also spilled the beans that Little Woods writer-director Nia DaCosta was all set to helm the reimagining/sequel thing. The "spiritual sequel" to the original Bernard Rose-directed film starring Virginia Madsen will reportedly return to the neighborhood where the legend began: the now-gentrified section of Chicago where the Cabrini-Green projects once stood. The movie is all set to bring sweets to the sweet in your local multiplex come June 2020. No cast has been announced thus far, but what are the chances that the powers that be behind the scenes pull a Blumhouse Halloween and cast the original film's aging actor in their iconic role yet again? By this I mean, what if Peele and friends decide to recast Mr. Tony Todd as the titular hook-handed nightmare fodder? I'd be more than down with that! But what does Todd himself think of this upcoming remake? Well, the deep-voiced-one recently sat down and had an interesting chat with SyFy about just those matters, and he had some very Tony Todd things to say about it. NOTE: Make sure to read these answers in Tony Todd's voice. It makes reading the news fun. First, let's cover the general feeling the man has on the remake. "I have mixed feelings because I thought they were gonna make this 15 years ago. If this had been 10 years ago when I had heard the news, I would have been devastated. I would have fought for it. Now I'm in a different place. I've got so many other options that even if they make it without me, which I doubt, the attention the new movie will create will lead folks back to the original [film] because people like to see the source material." Todd then goes on to speak a bit about how relevant he thinks the Candyman character and story are in this day-and-age, telling the site this. "[Candyman is still relevant] particularly today, now more than ever. In 2018, I think there are a few neighborhoods that could use some Candyman justice, you know what I'm saying? I'm just happy that as an African-American man, that Candyman has once again been given the nod to enter people's consciousness." Is there anything he hopes gets to be explored in the updated version? "I hope that they don't dance around the [interracial] relationship between Candyman and the love of his life, the reason for his death and that they are actually allowed to kiss. [Back then] it was rare that African-American male film stars got to kiss any of the white leading ladies they worked with. I'm just speaking my mind here." And finally, the man spoke about what genre of film he'd like to explore that he hasn't so far in his long career, saying this. 'I wish I could do a black and white film. [Black people] look good in black and white - our skin tone is perfect for it. Everything about it is wonderful. Especially now that there are new lenses and lighting techniques out there that have been developed for us. And there are finally a couple of makeup lines that finally are for us, so we don't look have to look like we have a pancake on our face. We are naturally beautiful. People need to understand that." Personally, I hope Peele and DaCosta decide to keep Todd in the role of the Candyman. After all, there are loads of quality young African American actors out there that would positively (no pun intended) KILL this role, such as Lakeith Stanfield or Daniel Kaluuya, but not a single one of them out there has Todd's VOICE. And that to me seals the deal right there. But whatever they choose to do in the end, I'll be there opening night as not only am I a fan of Bernard Rose's original film adaptation, but I'm a massive fan of author Clive Barker and his original short story The Forbidden which the movie and character were based on. Thanks to our buddies over at SYFY for the interview!